Please raise your hand if you’re ever worried about someone logged into your Facebook account without your permission. They may have various tricks to log in your Facebook account. Of course, you can recover later if you have registered mobile number or trusted friends on your Facebook. But ever thought to secure your Facebook even when you’re away from it? Well, there is a simple solution for this. Set up two-factor Authentication for Facebook to keep your account secure all the time. What is Two-factor Authentication for Facebook? Two-factor Authentication is a security feature that helps to protect your Facebook account from unauthorized logins in addition to your password. It adds an extra layer of protection to protect your account from hackers. If you set up Two-factor Authentication, you need to enter a unique security code or confirm a login attempt each time when someone tries to login you Facebook either from Computer or Mobile device. Therefore your account gets extra protection and helps to get rid of hackers. Two-factor Authentication doesn’t work unless you add either a Phone number or both security key and code generator. 1. To Set up this feature, open the Facebook on Desktop browser and click the arrowhead at the top right to expand the Menu. 3. On this side, you’ll see different Options. Select Use Two-Factor Authentication. To setup Two-Factor Authentication, you need to add either a Phone number or both Security Keys and Code Generator. 4. Go to Text Message(SMS) and click on Add Phone Number link. Add your Mobile number for which you would like to receive Security Passwords at the time of login. 5. Check your Mobile phone for a Confirmation code and enter the code in given field and click confirm. 6. Now you’ll see the Text Message(SMS) field with your Phone number. Click Enable link. 7. After clicking Enable, a pop up will appear. Click Enable button. 8. 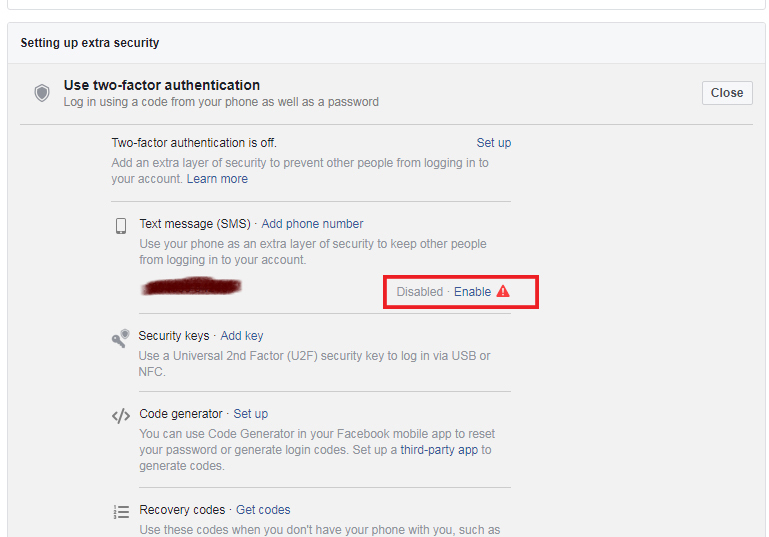 Finally, you have enabled Two Factor Authentication for Facebook, and you can disable it any time. Other than Text Messages there are five more ways to get Two-Factor Authentication for Facebook. The security key is a unique USB device with U2F support. This security method is used by big companies like Google, Microsoft, etc., for better security. It adds an extra security feature to your password. You can use it while logging into your Facebook account from a Computer or Mobile devices. In other words, using security is same as like using a key to unlock the door. After entering your password, you can tap into your security key instead of entering a password. With this in mind, keep note that these keys only work with selected browsers and Mobile Devices. It is better to keep another authentication like Mobile Text Message or Code generator. To Add security keys, you need the latest version of Google Chrome or Opera browser. Scroll down to setting up extra security and click Use Two-Factor authentication. Go to Security keys and click Add Key. Now just follow the on-screen instructions. If you successfully added your security key, it will appear with the name you’ve given in your security key section. How to use the security key? If you add a security key, Facebook will ask to tap on security key when you tried to log in from an Unrecognised device on Google Chrome & Opera browsers. Insert the Security key on USB port and Tap it with your finger. If you don’t have a security key or it isn’t working, you can always click Use a Different Method to log in using other authentication methods like Mobile, Recovery codes or code generator. Code Generator is an Authenticating security feature which generates randoms codes whenever you turned it on. As a result, your phone will generate a unique security code that you can use to authenticate your login attempt another computer or mobile Facebook. Scroll down to Use Two-factor authentication and click on Code generator and click Setup. According to Facebook Code Generator can be only available for a Facebook app for Android and iOS. But you can use this feature for Desktop version on Chrome with the help of Authenticator extension. You need to set up authenticator with the help of QR scanner and all set to get 6 Digit security code whenever you log in to the Facebook desktop version of chrome. If you don’t have your Phone with you or unable to verify through Code Generating app, You can use this recovery code for instant login. Besides, you can print them out or screenshot and keep them safe. Remember that each of these codes can use only once. If you used the 1st code, next time you need to use the 2nd code. You can read about App Passwords here. When you’re unable to login from above methods, you can use this method for instant access to your Facebook account. You already need to log in from another device so that you’ll get a notification to your account and you can give access to your Facebook account from the new device. 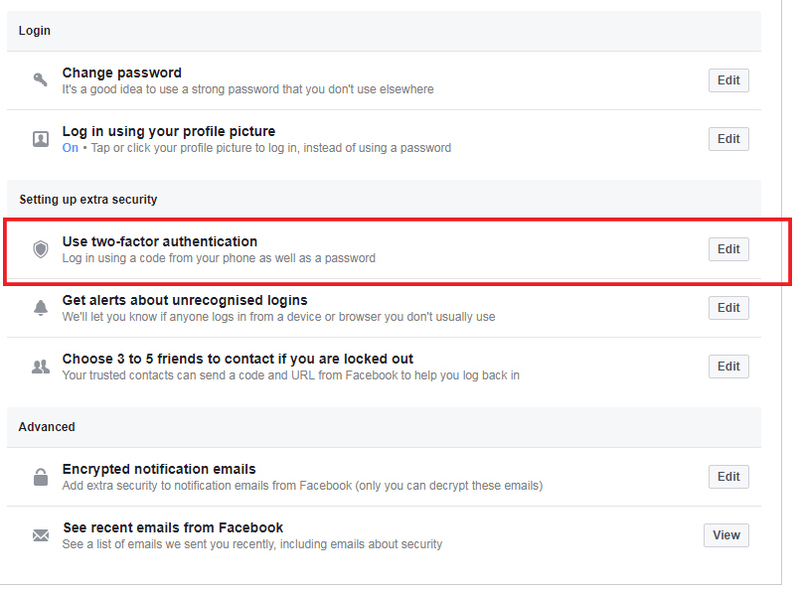 As shown above, you can choose any one of the method of Two-factor Authentication for Facebook. My choice is Text message method. This method is secure, and you can get the security code directly to your mobile. In an emergency, you can use authorized logins or Recovery code methods. Be sure to change your password frequently.